India is a country with a rich cultural heritage. With the level of diversity on offer in terms of ethnicity and religion, it would be wrong to pinpoint a specific wedding style as the authentic Indian wedding format. However, there are general bits that are present in most Indian weddings which when combined, can make for a perfect Indian themed wedding. This piece takes a look at them. The invitation cards are your perfect way to communicate what guests should expect from your wedding celebrations. You can print standard wedding cards with notifications to guests on your plans for an Indian theme. If you would like to hint on extravagance, pick jewel coloured invitation card design with lots of embellishments. 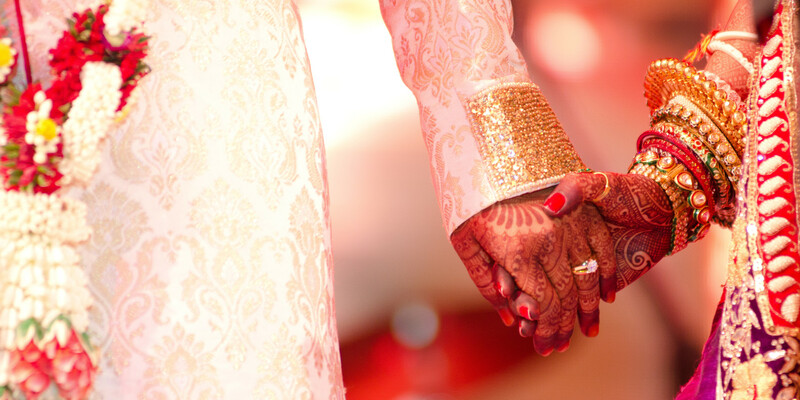 The standard location for an Indian wedding is a Palace property. Take a look at your options and find one that offers the most space within your budget. Where you can’t find a Palace property, you can talk to a wedding décor company to help put together the perfect Indian scenery. This typically involves plentiful elegantly coloured drapes, chandeliers, pillars, and artificial lighting. Prayers are a strong part of Indian wedding. You need to arrange for an authentic Indian wedding priest or at least find someone that can stand in. The stand-in should be able to do the Ganesh Puja (Prayer to Lord Ganesh) which is vital for the opening of the wedding ceremony. Flowers and sweets are offered alongside prayers by the priest and bride and groom’s parents. The main theme in most Indian weddings is heavily ornamented flowing dresses. You should be able to find designers that can put together something close to the standard fare. You can take inspiration from Bollywood images online but do not go over the top with embellishments. Fabrics that can be used are Batik, Lehriya, Ikat and Bandhini. The fabrics mentioned above can fit in nicely when it comes to venue decorations. A touch of your selected fabrics should be used as table runners, napkins, cushions, around signage and other wedding stationery. Block prints, mirror works and embroidery can be equally be used in the same way. This is a what you will need to do for a standard location for an indian wedding and make sure that the space looks authentic and fabulous. For the table arrangements, try using traditional urlis filled with flowers and diyas. The table settings can include brass crockery and cutlery to give it a more Indian look and feel. Candles with henna designs are a beautiful addition to the decor. Additional elements like peacock feathers, Indian embellishments, colorful bangles etc are also interesting props that can be added. Incorporating Indian motifs, bright Indian colors and Indian prints into your stationery and signage are also a great idea. Think about having Indian motifs and designs on your wedding cake. The bridal train should be dressed in Indian wear. The design should however be different from the bride’s dress design and should feature a little less embroidery and ornaments. The Baraat (The Groom’s procession) is one of the pillars of any Indian wedding. The groom is accompanied by friends and family as he enters the wedding venue on an elephant. Horses are equally used. The procession is accompanied by music and is joined at the venue gate by the bride’s family. When done properly, this makes for a great spectacle. “The food is one of the things guests look forward to in an Indian wedding”, say the experts at Royal Nawaab. “You should ensure everything is in place to pamper your guests with high quality Indian cuisine. Guests can be adequately catered for by offering a variety of options ranging from very spicy options to non-spicy options like chaat. Indian sweets, (Dal and Mithai) should not be left out”. As already mentioned above, the music is an integral part of the Indian wedding and you therefore need to find the right bands. Book a wedding band that understands Indian music properly and your wedding will truly be one that will be talked about for quite a while!